Julie Nelson Davis discusses the remarkable relationship between Hokusai and his daughter Katsushika Ōi, an accomplished artist in her own right who supported and worked as Hokusai's collaborator during the final two decades of his life. Katsushika Ōi (about 1800–after 1857). Display room in Yoshiwara at Night. 1844-54. Hanging scroll, ink and colour on paper. Ōta Memorial Museum of Art. Tsuyuki Kōshō (Iitsu III, died after 1893), Hokusai and Eijo in their lodgings. Ink on paper, before 1893. National Diet Library, Tokyo. Every time I think about this exchange between Hokusai and Eijo, I find myself amused at how cheeky she was. To call out ‘Ōi’ in Japanese was then, like it still is now, very informal and even rather impolite. When she replied with the lyric of a street-caller soliciting sales from passers-by, she must have been taking the mickey. Hokusai seems to have often called out ‘Ōi, Ōi’ when he wanted her. So Eijo used characters that replicated the sound of the word ‘Ōi’ into an artistic name for herself meaning: ‘Loyal to Iitsu’. She was referring to the name Hokusai used after he turned sixty, ‘Iitsu’, meaning ‘one again.’ With this new name she turned something kind of disrespectful – that ‘Hey you!’– into something that showed her deep connection to Hokusai, and she often signed her work with this name. But Eijo was something more than just loyal to Hokusai. She was his collaborator during the final two decades of his life and may have even worked as his ‘ghost brush’. Eijo was the most skilled painter of all of Hokusai’s children. She was, along with her sisters Miyo, Tatsu, and Nao, brought up assisting their father at his trade and in his workshop. Their brother fulfilled a family obligation by apprenticing in the mirror trade and became a successful artisan. 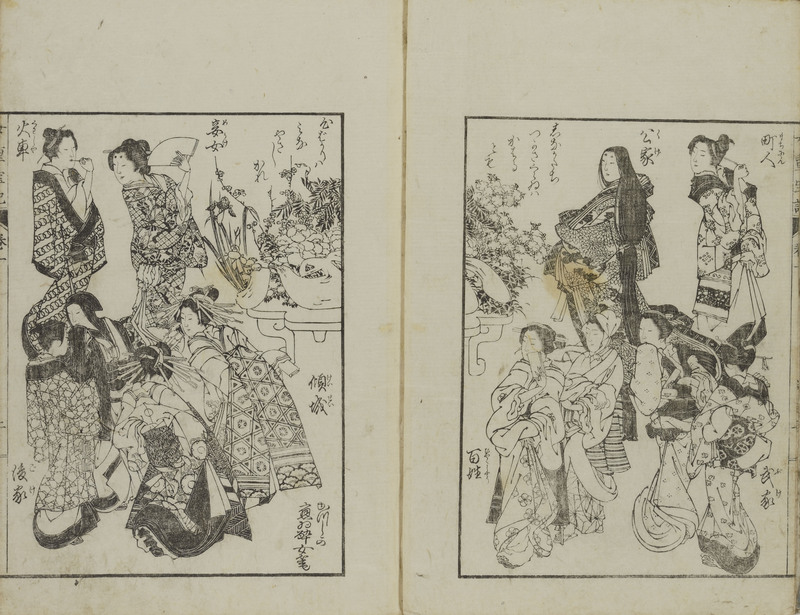 But for Hokusai’s daughters, apprenticing in a profession outside the home was not an option – they were expected to help their family’s occupation until they married and worked for their husbands’ households. They became skilled in all the tasks important to being a painter, from preparing materials to composing pictures, working alongside Hokusai’s other students. Eijo left Hokusai’s workshop when she married one of his students, the painter Tsutsumi Tōmei (active 1804–1830), in 1824. She returned to the workshop just three years later when their marriage ended in divorce. It was rumoured that they fell out after Eijo commented, apparently too critically, on Tōmei’s lack of skill as a painter. (I can imagine that as the daughter of Hokusai she would have had an opinion about painting!) After her mother, Kotome, died in 1828, Eijo assumed the role of caring for her father, now in his late sixties. Neither she nor her father seemed to care much about keeping house. Rather, they preferred to draw and paint – it was, after all, the family business – and working together carried on the Hokusai brand through illustrated books, prints, and paintings. Katsushika Ōi (about 1800–after 1857), Treasury of Education for Women (Onna chōhōki). Illustrated book, woodblock, published by Suharaya, 1847. Just as Eijo supported and collaborated with her father, Hokusai also acknowledged and appreciated her talent. Hokusai said that ‘when it comes to paintings of beautiful women, I can’t compete with her – she’s quite talented and expert in the technical aspects of painting.’ Looking at her illustrated book of instructions for women and its range of beautiful figures, we can see what Hokusai meant – these are very skilfully rendered beauties, indeed. We can see from her paintings that he was right about her exceptional technique. Her painting of a night scene in the brothel district is one of the most moving depictions of that quarter, capturing both its artifice and its artificiality. She has turned the courtesans who were so often shown as fashion plates into anonymous figures, obscured by the lattice, capturing the pathos of their existence as indentured prostitutes. 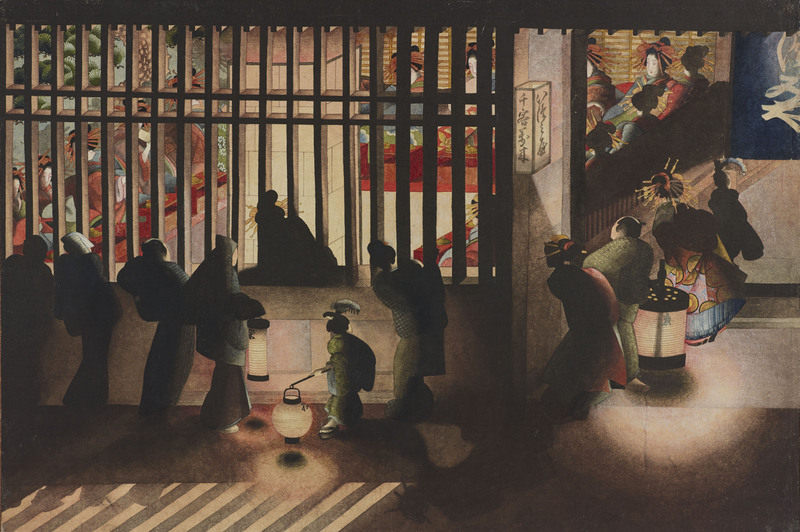 Katsushika Ōi (about 1800–after 1857), Display room in Yoshiwara at Night. Hanging scroll, ink and colour on paper, 1844–1854. Ōta Memorial Museum of Art. She apparently gained a reputation for her skill as a painter during her own lifetime. The artist Keisai Eisen (1790–1848) wrote that she ‘is skilled at drawing, and following after her father has become a professional artist while acquiring a reputation as a talented painter.’ Her knowledge of painting was so complete that she wrote a letter explaining how to prepare the colour red in a letter to a distant pupil, illustrating the letter with fingers showing how to break the raw material down before beginning the process. We wonder, too, how much she might have contributed to Hokusai’s book on painting techniques. Katsushika Hokusai, Picture book: Essence of Colouring (Ehon saishiki tsū). 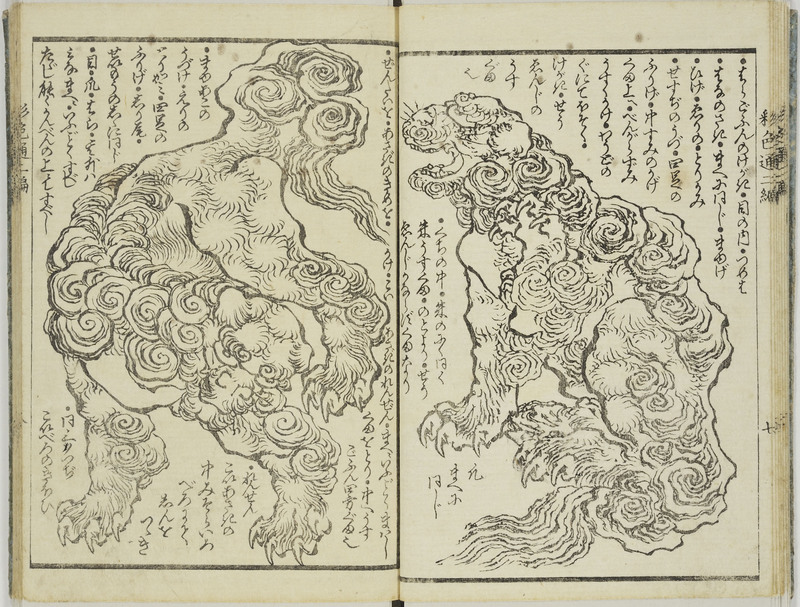 Illustrated book, woodblock, 2 vols, published by Yamaguchiya Tōbei and others, 1848. Looking at her painting of legendary warrior Guan Yu having his arm bled to remove poison from an arrow might make us react at first with a little shock and horror, just as his companions do. But if we look beyond the action at the centre of the painting to consider the entire work, we come to admire how she has juxtaposed the violence of his ordeal with the order of the interior. We note how the room and its elements, with its straight columns, elegant furniture, and the still life of food and drink in the background, is designed to provide a counterpoint of quiet against the controlled chaos. What we might not notice right away is that this painting is on silk, replete with saturated pigments, both signs of expense. 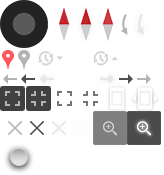 This painting would have been commissioned, ordered by a well-to-do patron. Unfortunately, the patron is not known, but we can surmise that it was due to her reputation, her skill, and her extraordinary handling of colour that she was asked to paint this scene. 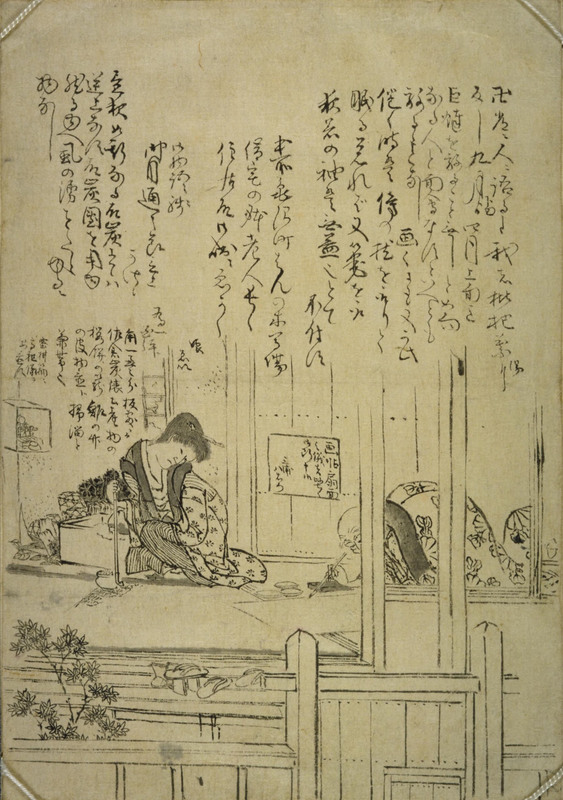 We are lucky to have a sketch made by one of Hokusai’s students of a memory of a visit he made to the father and daughter in their rented lodgings in the 1840s (see the first illustration). By this time, Eijo would have been in her forties, and she is shown here leaning on her tobacco pipe watching her father at work. Hokusai, now in his eighties, spends his days under the comfort of his kotatsu (a heated table), drawing until he falls asleep, waking only to draw again. On the wall behind them a notice states that under no circumstances will they paint for fans or albums – for these were minor works for which they would have been paid little. We cannot know just what it is that Hokusai is painting, but we can see from Eijo’s look that she is attending to his process, perhaps conversing, sitting near enough that she could move to assist but not crowding him. It is a picture that shows how Eijo, as a daughter, caretaker and assistant, cared for and collaborated with her father. And she remained with Hokusai throughout the rest of his life, witness to his final words, ‘just let me live ten more years… just five more years…’ loyal to Iitsu to his very end.